Cozycot's February CozyFest celebrates the great spirit of love by commemorating the most SIGNIFICANT and ROMANTIC time of your love life. Snap a picture of something significant and symbolic (eg. an object, a place or a person) and tell them a short love story behind the meaning of the picture. Submit by Feb 10 for chances to win prizes from Klapsons, Sake Sushi and The Face Shop. Beauty.com offers free LORAC Mini Couture Shine Liquid Lipstick in Glam with any $10 purchase. No code needed. Click on the link to get the offer. Boscia offers free Rose Blotting Linens with purchase of $25 or more. Use code ROSE12 at checkout. Valid till Feb 6.
e.l.f cosmetics offers 10 Free Mineral Eyeshadows (worth $30) with orders of $25 or more. Use code DELIGHT at checkout. Valid till Feb 6. La Mer offers free shipping and a sample (3ml) of radiant serum with any purchase. Enter code LMLOVE at checkout. Valid till February 3. NOIR Cosmetics offers an Ultimate Smoky Eye Set for $19 (retail price $61). Set includes a lash lust mascara in black out, smooth blend eyeliner in smog and jewel box eye shadow palette. Click on the website and enter Discount code TODAYNOIR to get the set. Valid for 24 hours only. QVC has some special offers on philosophy until February 16. Urban Decay offers free shipping with any purchase inclusive Lip Love ($16). No major sales/deals happening in Singapore except those I shared before. So today's steal and deal will be US coupons only. Bobbi Brown offers free shipping and free deluxe samples of Extreme Party Mascara (3 ml) and Crystal Lip Gloss (7 ml) with any purchase. Enter code VDAY12 at checkout. Valid till February 3. Crabtree and Evelyn offers a Pocketbook Favourite set for $20. The set worth $32 includes a 25g hand therapy and a luscious lip tint in a Tech Wrislet. 4 combinations to choos from. DermStore offers free two day shipping and choose a free gift valued at up to $211. Four kits to choose from, each has a black tote plus at least five products; see site for details and codes. DermStore offers 20% off all Pangea Organics products. No code needed. Valid till February 5. Folica offers 20% off Top Ten Lists. Enter code TOPTEN20 at checkout. Valid from February 1 to February 6. Kiehl’s offers free shipping and a free deluxe sample of Ultra Facial Cream with purchase of Creamy Eye Treatment with Avocado ($27). Enter code AVOCADO at checkout. L’Occitane offers limited edition Valentine’s Day travel sets. Spend $45 and get one for $18; spend $90 and get both for $36 (there is a His set and a Hers set, the Hers set features new fragrance Cherry Princess). No code needed. Valid till February 19. Mario Badescu Skin Care offers free shipping, free gift worth $25 and extra 10% OFF with purchase over $50. Use code JANGIFT at checkout. Valid till Jan 31. Sally Beauty offers a few coupons on beauty products. Click on the link to view their brochure. Shiseido offers free shipping and a free deluxe sample of The Skincare Instant Eye & Lip Makeup Remover and four Facial Cottons with purchase of new Instant Eye Lift value set ($79; includes new Benefiance WrinkleResist24 Intensive Eye Contour Cream and new Perfect Mascara Full Definition in Black). Shu Uemura offers free shipping with any purchase. Enter code FSHIPPING at checkout. Valid till February 5. Registered members can choose a free deluxe sample at checkout. Skinstore offers 20% off any purchase. Enter code CUPID20 at checkout. Valid till February 13. Spalook offers $20 off $100 with code LUV20 or $50 off $200 with code LUV50. Valid till February 13. Trish McEvoy offers free shipping and a free 15ml Wild Blueberry Vanilla Scented Candle with $80 purchase. Enter code TMCANDLE at checkout. Valid till February 3. ULTA Beauty offers a free gift boxed picture frame or gift boxed pair of champagne flutes with charms with $30 fragrance purchase. Choose your free gift from the dropdown menu in the cart at checkout. Tangs is having their 12% rebate day again on Feb 2. There are a few beauty value sets and GWPs. Plus you can receive $25 voucher with $250 spend on beauty (max 3 same day receipts). Details can be find at their brochures page 7 and 8. Nothing much available right now. But I found a coupon for Paula's Choice, use code SL45DGD at checkout to get 15% off. They are having some nice products in sale section and can be combined with the coupon. And Gilt has a Baby Quasar sale event starting very soon. It was a sold-out last year when there's 30% off. 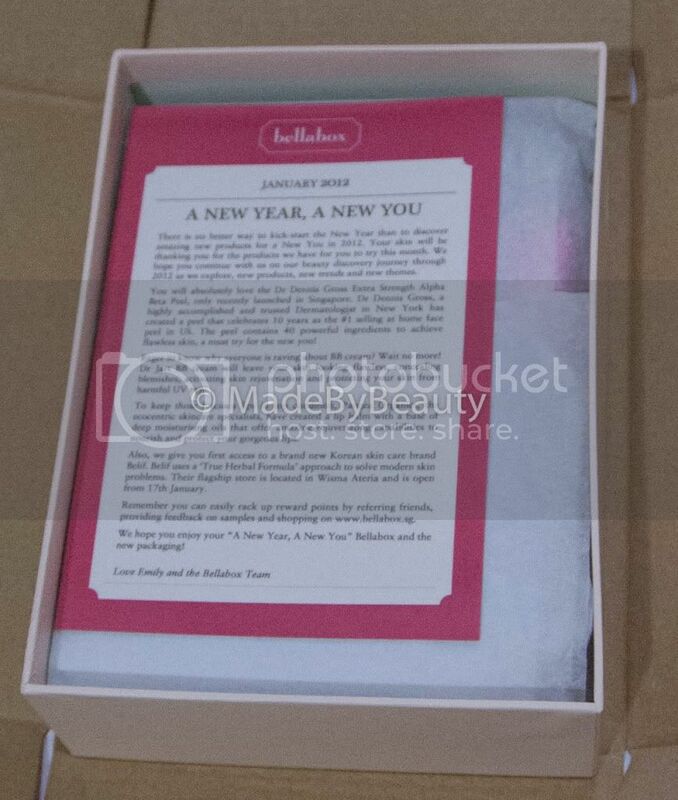 BellaBox said they have changed the packaging. I haven't receive any from last year, (heard that last year's boxes were only sent to press and bloggers). But this lite pink box is good enough for re-use as jewelry/makeup/skincare storage. This is how the products look like in the box. A small booklet introducing a new Korean brand Belif. 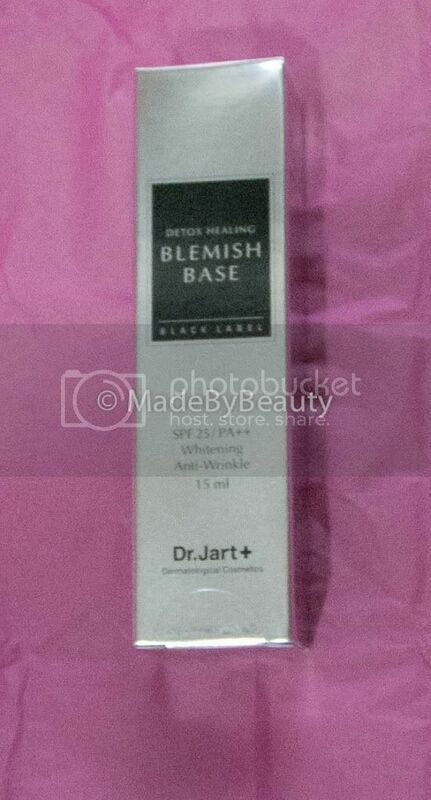 A deluxe sample each from Dr Jart and Belif. A packette sample each from Dr Dennis Gross and Herban Essentials together with a full size lip balm from Pangea Organics wrapped by (another!) pink paper. This is a group photo of all the products. 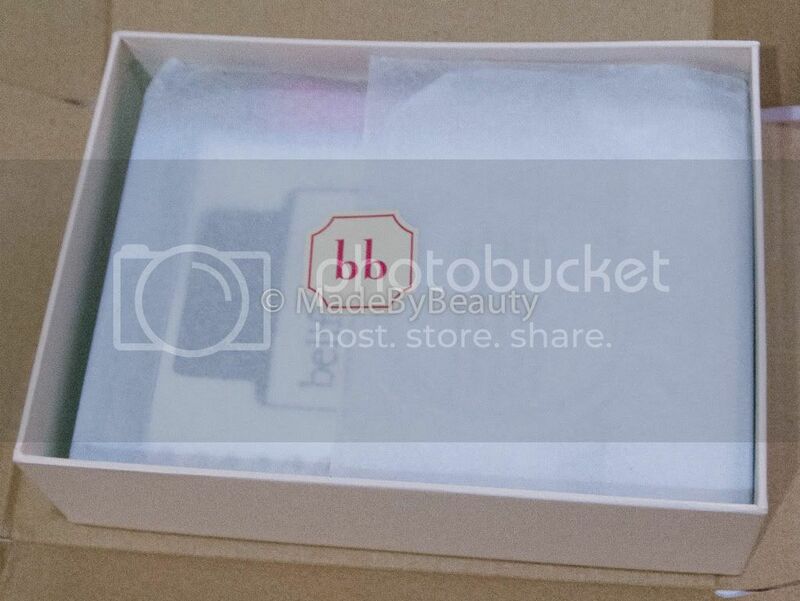 BellaBox claims that it supplies Luxury Products - Well, not really. 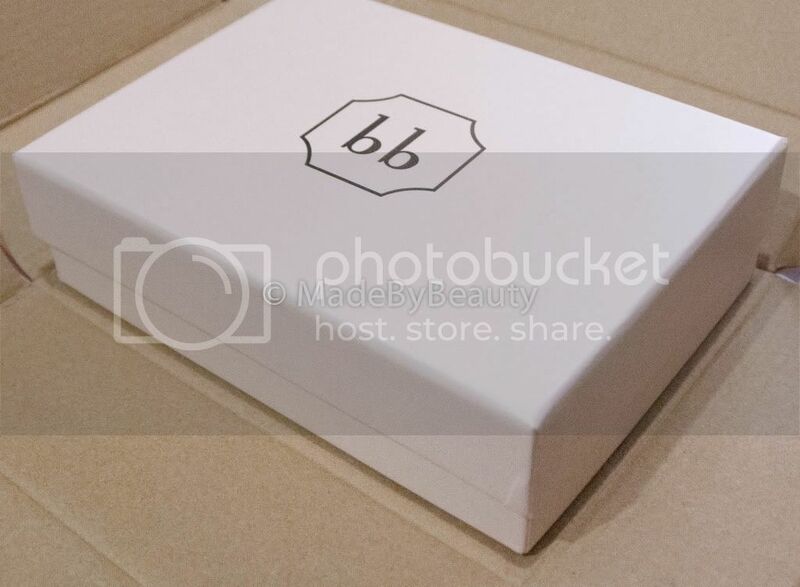 But in terms of selection, I personally think BellaBox is more appealing than Glamabox. Plus it's cheaper, you definitely gets more value for $15. But I do love it a lot, and was so happy to see it comes in the box =) This peel looks like a peel - but it's actually not! It actually can be used as a peel, toner, and even moisturizer. After these step 1 and step 2, your skin is moisturized enough without any cream/lotion. Of course it would be good to have extra layers of serum and creams, but if you are lazy, these 2 steps are enough to keep your skin look good. Known from the name that it comes with extra strength, so avoid it if you have sensitive skin. But for me as a combination non-sensitive skin, it has become my holy grail. It's kinda magic, stabilize, kills bacteria, anti-aging, brightens skin, works for blemish and wrinkle... It does almost everything! If you are interested in the product, maybe a good idea to look at the reviews over Sephora. As a revolutionary product, it gets really hight score in Sephora reviews as well! I was first introduced to Pangea Organics brand with its Japanese Matcha Tea Acaigoji Berry Mask. I loved the mask for its cleansing, tightening and brightening effects. So I was quite eager to try this lip balm when I saw the product. It didn't let me down. A light lavender scent is very lovely (I hate strong smell when it comes to lip balm). Not sticky or messy, absorbs quite fast. It stays for a while but you need to re-apply it during the day if your lip is as dry as mine. I sometimes use it as a primer under my lipsticks and turns out well with a natural glow. It won't substitute my Fresh Brown Sugar lip balms. As Fresh is more moisturizing. But this is much cheaper than Fresh! =p So if you think Fresh is a bit too expensive, or your lips are not dry type. Pangea Organics is an A+ choice. Instead of a BB cream, it feels more like a combination of foundation and sunscreen. It comes with a good medium base coverage so it you are looking for something lighter or heavier, it's not for you. The oil control is not decent enough for my combination skin, so oil-controlling loose powder is a must if you are not dry skin. The packaging says it has whitening effect - don't expect anything from this as it's the most outside layers of your skincare. Another American brand. 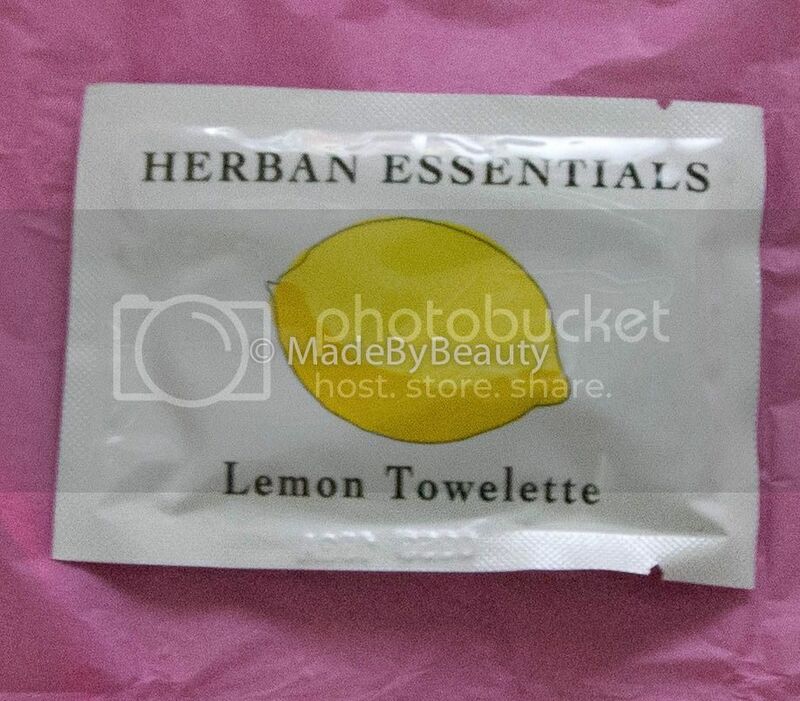 I used a lot of towelettes and this has been the most refreshing among all of them (previously I often buy from Watsons or Guardian when they are on sale). Good that it comes with no chemicals or alcohol. My hands are soft and smells amazing after using it. I love it a lot but the high price make me think twice before ordering. Belif is a Korean brand just introduced to Singapore market. 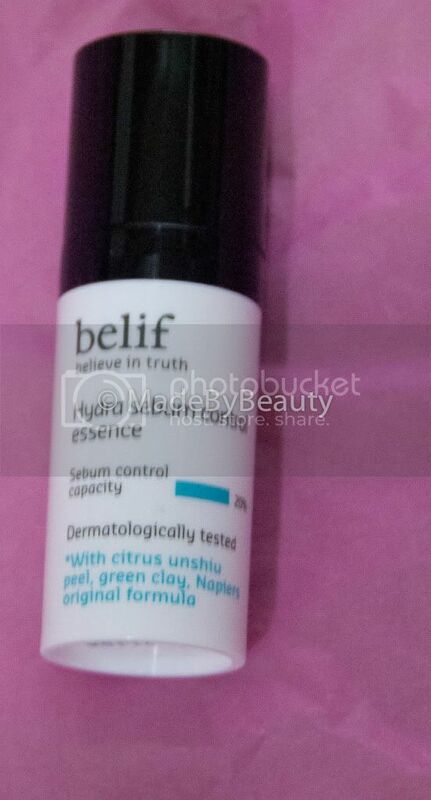 It's my first time using Belif product and I have to say frankly that I don't find any value in it, yet. Maybe because it didn't come with a user manual that I don't really know when to use it. I tried it both under and on top of my day cream, but still find it didn't help with sebum control, especially my T-zone - it even looked worse with excess sebum in the afternoon. Any girls know how it should be used please tell me! Thanks so much! Anything else I don't have the say yet, as it's only their first box I received. I will continue to do reviews of the boxes (will do a review on January Vanity Trove soon) and things will surely become clearer alongside. Keep moving! Elizabeth Arden has a special Prevage eye set available at their Takashimaya counter until Jan 30. Goes for $192, set content is as in the picture below. Special GWP available with $250 purchase. Laneige is sending 3 BB angels down the street of Orchard TODAY (Jan28) from 1pm-6pm. Do look out for them along Ngee Ann City to Cineleisure. They will be giving out exclusive gifts. Cozycot has an exclusive beauty bazaar together with Tangs One Beauty Place spa. Feb 09 and 10, 11am - 7pm, Cozycot office at #26-05 Shaw Centre. You will be able to find up to 80% off spa brands like Payot, Gatineau & Decleor. Burt's Bees is offering $5 off + free shipping with coupon code 5FREESHIP. This can be used on Burt's Bees Grab Bag . Get 20% off Hair Tools at Folica.com. Enter APP20 at checkout. Valid till Jan 31. Today's Deal at QVC is Kate Somerville Dermal Quench Liquid Oxygen Treatment. Special price ends 1/27 at 11:59 PM ET. QVC.com is having some new and special offers on philosophy for a limited time. Zenmed Skincare offers $4 off Dermcare system. Use code GCJ5CD7EE3B at checkout. Valid till Feb 3. FeelUnique.com offers £4 off purchase of £35 or more. Enter code BEAUTY4ME at checkout to redeem. - Glamabox are charged every 15th and shipped in the first week of next month. - The December box was supposed to ship in first week of January but it was shipped earlier before Xmas for the holiday. - To make it easier, they will change the naming from the coming box onwards. They will no longer name the box to the month it's charged, but the month it shipped. - So there will be no January Box, but February box. Though we'll still be charged in January. Hope this helps my fellow glama-girls, and I sincerely wish the next box will not let us down, from such long wait. Finally the last one is a real deal. Majolica Majorca is having a $3 markdown on their eyeliners, eye shadows and mascaras at Watsons stores! Valid till 1 Feb.
Bath and Body Works offers 20% off any purchase and free shipping with $25 purchase. Enter code EBATES1 at checkout. Valid till January 28. Get extra 6% cash back now if you shop through Ebates. Beauty.com offers free shipping and a free deluxe sample of Dr. Dennis Gross Skincare Active Vitamin-D Serum Oil worth $6.5 with $10 purchase. No code needed but you must click on the link to get the offer. Beauty Habit has started to offer Paul & Joe's kitten collection. Receive a collectible cosmetic pouch with $75 purchase of Paul & Joe. Enter code MEOW at checkout. Valid till February 14. Biotherm offers free shipping with any purchase. Enter code SHIPJAN at checkout. Valid till January 29. Bliss offer: Buy a $150 gift card for only $120 from now until Jan 27. No code needed. Valid only on physical cards, not e-cards. Clinique offers a free deluxe sample of Even Better Skin Tone Correcting Moisturizer SPF 20 with purchase of even better products. Enter code POWERCOUPLE at checkout. You can choose one additional free deluxe sample at checkout. Cosmetic America offers $5 off $45 order. Enter code D9TK6 at checkout. Or $10 off $85 order with code G8X62 at checkout. Free shipping is available with $100 order. Offers can be combined with their current sale on Clarins, La Prairie, Shiseido and Sisley products. Valid till January 31. 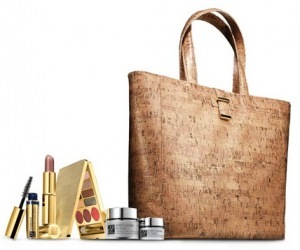 Elizabeth Arden offers $20 off any $100 purchase. Enter code LOVE20 at checkout. Valid till February 29. Get extra 10% cash back right now if you shop through Ebates. Estee Lauder offers free shipping and free deluxe samples of new Re-Nutriv Replenishing Comfort Cream and Eye Cream with $50 purchase. Enter code COMFORTME at checkout. Valid till January 28. 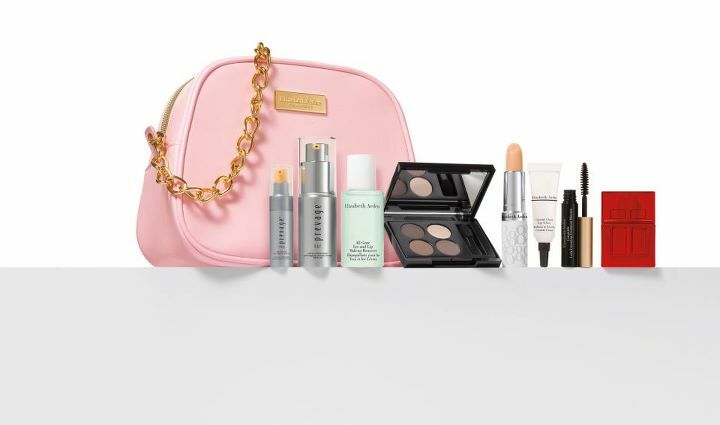 Jurlique offers a new value set that includes a white Clarisonic Mia, a full size Skin Brightening Cleanser, and a travel size Skin Brightening Essence for only $119 ($152 Value). No code needed. Available till January 29. Receive free shipping plus four brightening packette samples (Cleanser, Essence, Day Cream, and Night Treatment) at checkout. My Habit is having a Vincent Longo Cosmetics sale. NeoStrata.com offers a Free Full-Size Product with Your $100 Order. Click on the link to receive the offer. Ole Henriksen offers free shipping and a free deluxe sample (30ml) of Herbal Day Creme SPF 15 with $75 purchase. Enter code RADIANT at checkout. Valid till January 31. Origins offers free shipping and a free deluxe sample with any purchase. Enter code BONUS1 for 30ml A Perfect World Antioxidant Cleanser with White Tea; Enter code BONUS2 for 15ml Zero Oil Deep Pore Cleanser with Saw Palmetto & Mint; enter code BONUS3 for 15ml VitaZing SPF 15; or enter code BONUS4 for 15ml A Perfect World SPF 25 Age-defense Moisturizer with White Tea. Valid till January 29. Saks offers 4-pc gift set with $350 La Mer purchase. 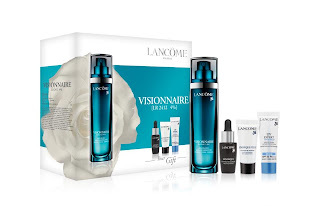 Gift includes 7ml Crème, 5ml The Radiant Serum, 30ml the Radiant Infusion and 30ml The Cleansing Gel. Enter code LAMER88 at checkout. Valid till January 29. Sephora offers a free sample of new Philosophy The Microdelivery Triple-Acid Brightening Peel with any purchase. Enter code BRIGHTPEEL at checkout. Skin1 offers 15% off Obagi items. Enter code Obagi5 at checkout. valid till February 2. StriVectin offers a free deluxe sample of Instant Retexturizing Scrub with any purchase. Enter code SCRUB at checkout. Wei East offers 25% off all regular priced items. Enter code Dragon at checkout. Valid till January 30. Excludes Final Goodbuys and Your Wei products. Wen Haircare offers an 3-pc introductory set (30day supply) for $29.95. Receive free shipping and 2 gifts with purchase of the set. They will bill you for another 90 day supply so remember to cancel your membership after the first shipment! Unlike many other beauty brands (you know who I'm talking about), Benefit is having a price MARKDOWN! I'm not sure how much they are taking off (I'm not a benefit lover), but I do believe this is a good action to reward their loyal customers. So girls, if you happen to love benefit products, go to Tangs L1 beauty hall to check out. Palmer's is having a giveaway at their Singapore facebook page, http://www.facebook.com/palmerssingapore. Enter to win 1 of 10 Palmer’s Cocoa Butter Formula Lip Balm this Chinese New Year. Neiman Marcus offers a nice Estee Lauder GWP. Spend $70 to get a 6-pc gift set worth over $195 including 14 day supply of Re Nutriv cream and eye cream, a mini size mascara, a full size lipstick, a palette with 8 eye shadows and 3 lip color, and a tote bag. Offer valid till Feb 5. Use code NMSHIP to get free shipping at checkout. Crabtree and Evelyn is having a private sale for 50-75% on selected merchandise. Valid till Jan 26 only. Click to enter. Sally Beautyoffers 20% off on all Orders of $50+. Use code 555685 at checkout. Starting Jan 27 through Jan 29. Click the link to get the offer only from Jan 27 onwards, the link is not live yet. I first saw this Skin Moisture Analyzer in Japanese and Taiwanese Beauty TV programmes. 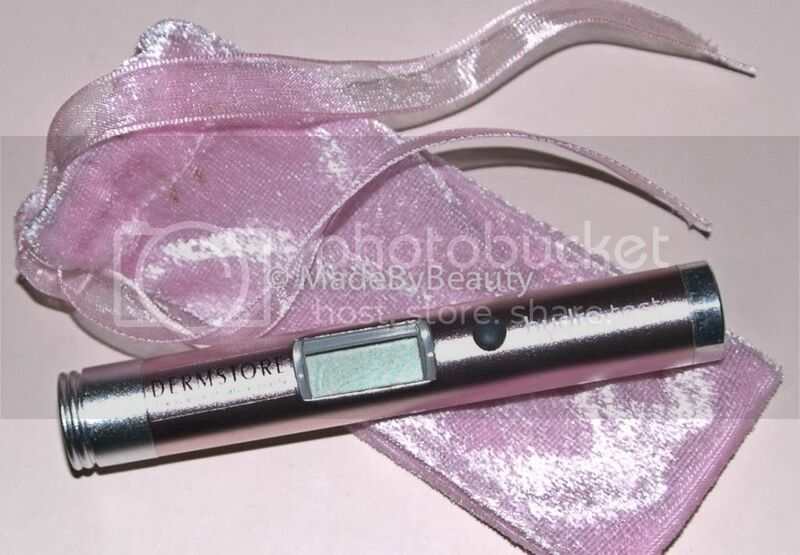 The teachers always use this analyzer to test and skin moisture before and after using particular skincare products. I felt that this is a very good way to prove that my moisturizing product is useful - particularly if it's able to lock my skin moisture for a few hours. And to tell me if I need to layer moisturizing products on top of my whitening/anti-aging/lifting products, if my skin lacks of moisture after using these products. So I looked through several beauty websites to look for this analyzer - and found it in the end. I didn't write about it immediately after I got it. But decided to use for a while. Until now I think it's the time to recommend this lovely little thing, which really helped me a lot in improving my skincare routine and regimen. It's pretty easy to use also. Just take down the cap, you'll see a chip on the tip. Simply hold it onto your skin, a 'bi' sound will appear in about 1 second time, and the skin moisture percentage will be shown on the LCD screen. Above is a photo when I tested it on my arm, and the result is 33%. Both Metro and OG have started their post CNY Megasales up to 70% off. There are no discount on beauty. But to my experience they will offer GWPs. Still worth seeing if you happen to have clothes/shoes/home items on your to-buy list. Beauty.com offers free shipping and a free Hot Pink Mini Ceramic Styler & Travel Case from Amika ($44 value) with $25 purchase. No code needed but you must click on the link to get the offer. While supplies last. This can be combined with the Marchesa deluxe sample bag offer, just click on this link first then the Marchesa banner on the home page. Beautorium.com offers a 15% OFF on Parisian Chic new natural skincare brand - Patyka. Benefit Cosmetics offers a free cosmetic bag with $35 purchase. Enter code OHSNAP at checkout. Valid till January 30. Shipping is free when you spend $50 for US orders and $115 for international orders. Blissoffers a free pair of glamour gloves with every purchase of $75. Use code GLAMHANDS at checkout. Valid till January 31. Bobbi Brown offers free shipping and two free mini palettes with $150 purchase. Gift includes Classic Day Palette and Classic Evening Palette, both include a blush, three eyeshadows, and a mini brush. Enter code ROSEG12 at checkout. Valid till January 27. Boscia offers a free full size Revitalizing Hydra-lift ($35 value). Enter code hydralift at checkout. Valid till January 30. Plus you can choose 3 free samples at checkout. Clinique offers a free deluxe sample of Super City Block Oil-Free Daily Face Protector SPF 40 with $30 purchase. Enter code SUPER at checkout. Valid till January 29. Plus you can choose one additional free deluxe sample at checkout. Elizabeth Arden offers a free deluxe sample of Prevage Night (10-day supply) with any purchase. No code needed. Valid till January 25. E.L.F offers the Sweetheart Collection ($30 value) for just $2 with any $20 purchase. Use code SWEET at check out. Valid till January 30. H2O Plus offers free samples with any purchase. Spend $50 and receive free shipping. Enter code calm1 at checkout. Hautelook is having Alterna Hair Care, Alison Raffaele Cosmetics, and Dermalect Cosmeceuticals sale events. June Jacobs offers a free travel size Gentle Creamy Eye Makeup Remover with any purchase. No code needed. Kiehl’s offers free deluxe samples of Midnight Recovery Concentrate and Rosa Arctica with purchase of new Clearly Corrective Dark Spot Solution at $49.50. Enter code RADIANT at checkout. Valid till March 15. Lab Series offers free deluxe samples of Max LS Age-less Face Cream and Max LS Overnight Renewal Serum with any purchase. No code needed. Valid till January 26. MAC Cosmetics offers Free 2nd day shipping with any purchase. Enter code MACLOVE at checkout. Expires January 25. Skinstore offers a free Ahava Men’s Travel Kit ($22 value) with $125 purchase. No code needed. Plus the 15% off with code 15JAN is still on. Stila coupon: With any $30 purchase receive a free full size Illuminating Tinted Moisturizer SPF 15 in shade 02 ($32 value). Enter code ITM30PLUS at checkout. Expires January 27 or while supplies last. 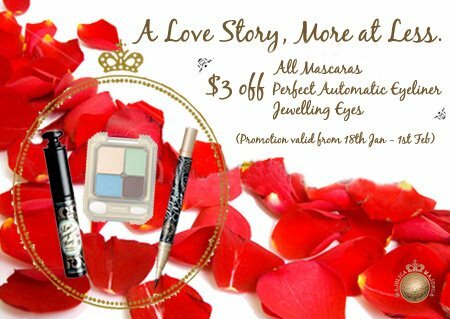 Too Faced is having their Valentine's Day Sale! 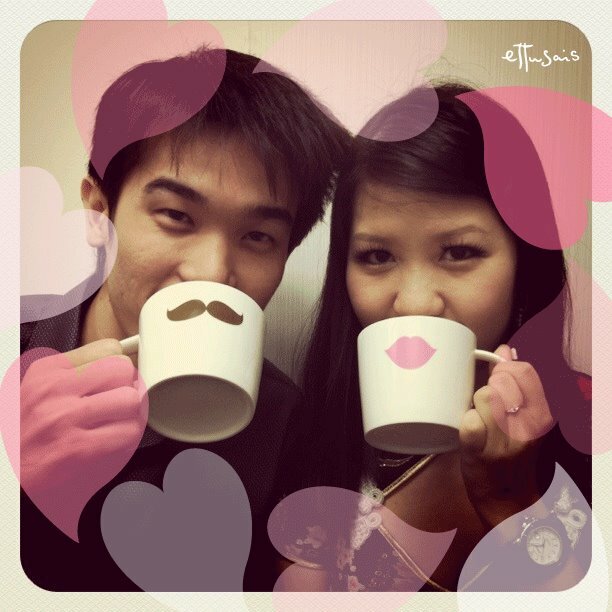 Receive free shipping, 2 free gifts and additional 15% OFF w/ code VDAYLOVE12. Sale ends February 14. ULTAoffers 20% Off your purchase with Code 62714. Valid till January 28. 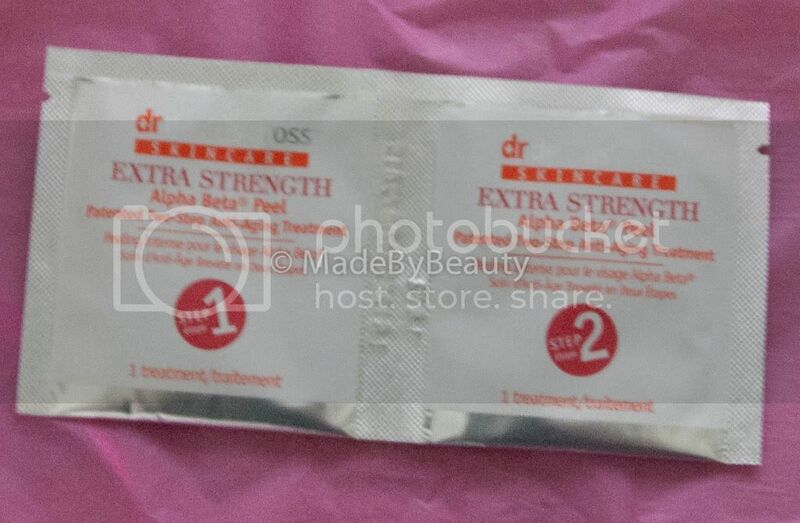 [Steal and Deal] Dermstore $12 Blow Out Sale! There's only one sale I'm going to share today. 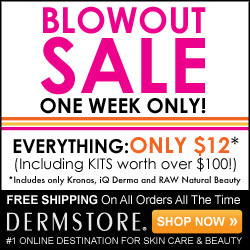 The Dermstore $12 Blow Out sale! Everything goes for $12, even those high end serum and sets originally sells for over $100! So here are the deals I collected. I have shared this deal before, but since this is a collection of CNY sales. I might as well share it again here. Clarins has a Chinese New Year Offer: Free 6pc Gift with $75 order - code DRAGON - valid 1/20-1/23. H2O Plus is offering a Free Deluxe Essentials Gift Set with any purchase of $28 or more via coupon code “DRAGON2“. Plus, apply code “110011” to get an extra 15% off. Free shipping on order $100+. The gift includes: Sea Results 3-in-1 Foaming Cleanser 50 mL, Sea Results Line Resolution Cream SPF 30 10 mL, Sea Moss Replenishing Body Wash 60 mL, Sea Moss Replenishing Body Lotion — 2 fl oz/60 mL, H2O Plus exclusive beauty bag. Laura Mercier offers $25 off $75 until 31st Jan. Plus you could choose another 2 deluxe samples while checkout. Use code D54099C901 at checkout. SkinCare Rx offers another round of 20% off site wide sale for CNY. Use code CNYSALE20 at checkout. Valid from today for 72 hours only. This is not really related to CNY... this is a Shu Uemura deal that I read from temptalia. With any $65 purchase, you’ll receive both cleansing oil and eyelash curler in a miniature size. Use the code TEMPTALIA at checkout, valid 1/23 through 1/27 at ShuUemura.com. The same Laneige facial that was offered in Metro is now available in Robinsons Raffles City as well. Check out my previous post for more details. Metro's post CNY big sale is happening from 25th onwards. 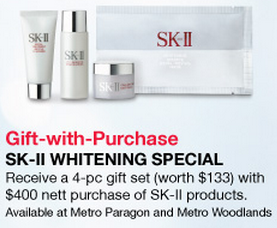 They will offer an SK-II GWP, 4-pc gift set worth $133 with $400 purchase, inclusive of cleanser, toner, surge cream and mask all from whitening range. Clarins has a Chinese New Year Offer: Free 6pc Gift with $75 order - code DRAGON - valid 1/20-1/23. Cosmetic America offers $5 off $45 order. Enter code D9TK6 at checkout. Or $10 off $85 order with code G8X62 at checkout. Free shipping is available with $100 order. Offers can be combined with their current sale on Clarins, La Prairie, Shiseido and Sisley products. Crabtree & Evelyn offers a sweet gift for $75 purchase, 3-pc pink pearl heart shape soap set. This offer can be combined with their winter sale. Dermstore offers a deluxe sample of Dr. Brandt dark circles away eye serum with any purchase of $75 or more. Offer valid while supplies last. Add any product to your favourite list to receive 10% off. La Mer offers complementary standard shipping and a sample of the radiant serum with any purchase. Enter code NOURISH at checkout. Today's Deal from QVC.com is Josie Maran Argan Beauty Practice Collection, special price of $69.96 until 22nd Jan.
SkincareRx is offering 2 beauty caches for $40. 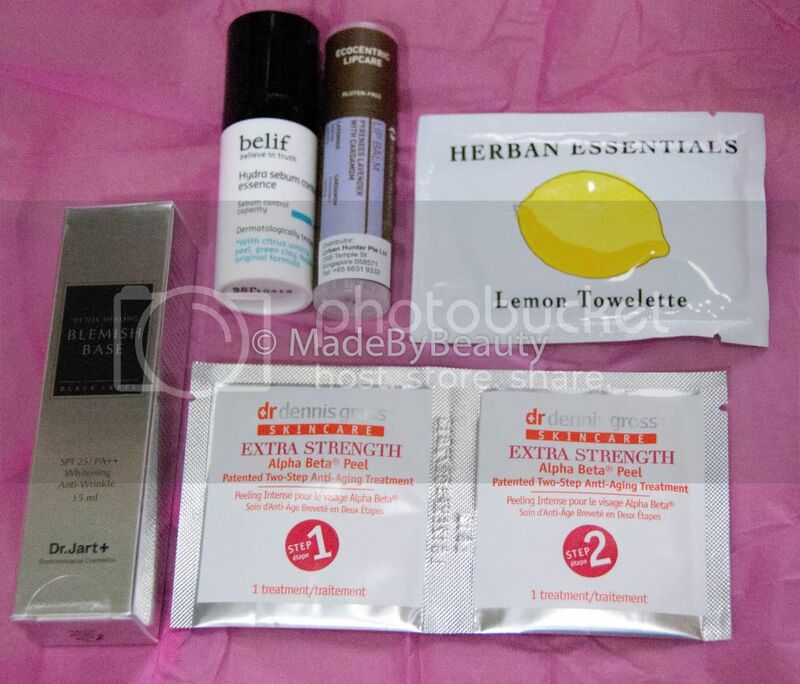 I've just received my last Mini Winter Getaway Beauty Cache and quite satisfied with what I got. Will do a review post when I have time this CNY holiday. [Deal] 2 bottles of Nail Polishes FREE from Zoya!